On October twelfth, thousands of Venezuelans gather every year at Mount Sorte (located in northeastern Venezuela), to participate in a pilgrimage honoring the Venezuelan goddess, María Lionza. María Lionza is the Queen of the indigenous religious movement combining Catholic, West African, and indigenous religions. The movement started in 1502 on Monte Sorte where María Lionza lived (and is said to still reside today). October twelfth also marks Columbus Day in North America, Spain’s national holiday, and the Day of Indigenous Resistance in Venezuela. The diversity of these dates is much like the indigenous religious movement itself and the numerous celestial spirits in her pantheon. Every Venezuelan can see a reflection of him or herself in this spiritual network. Venezuelans can therefore relate to these spirits personally, regardless of race, class, or gender. In her image, Venezuelans see themselves as members of a diverse nation at an individual level, reinforcing a sense of national unity from below. As the pilgrimage gained popularity, the state has become more involved. Since Monte Sorte (the location of the pilgrimage) has become a national monument, state officials are surveying the land. Thus, Maríalionzeros are no longer able to practice their beliefs on the mountain without the state watching and conducting routine stops on a daily basis. 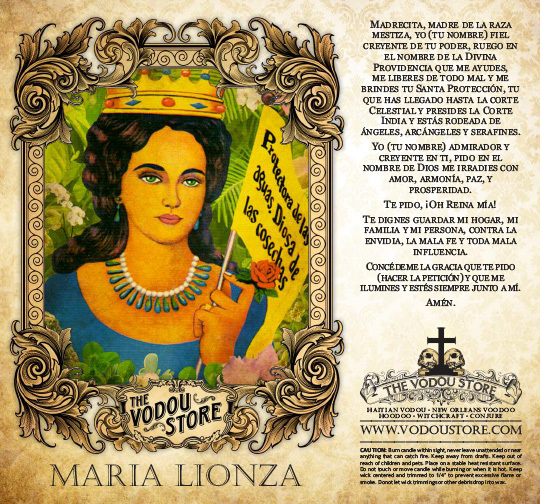 In addition, Maríalionzeros are no longer able to leave any objects used in rituals on the land as a form of respect and honor to María Lionza. If they do, they face fines as well as imprisonment. the recollection of specific moments from the past-those associated with different apical ancestors. It is when separate individuals recall their common descent from (and thus attachment to) a given ancestor that they reawaken their (latent) feelings of affinity for . . . and by that very act of memory, they (re-) define themselves as kin, that is persons who are joined together in the same familial group. Hence, in many ways, the movement itself is a form of Venezuelan kinship and ancestral foundation. Thus, confirming that such moments were indeed lived by their ancestors or kin. During this time, there was an Indian Chief named Chief Yaracuy, who had a daughter born with eyes green like water. She was named Princess Yara. Others feared the princess because she had eyes different from theirs. Some believed she was half Spanish, because of her light green eyes. 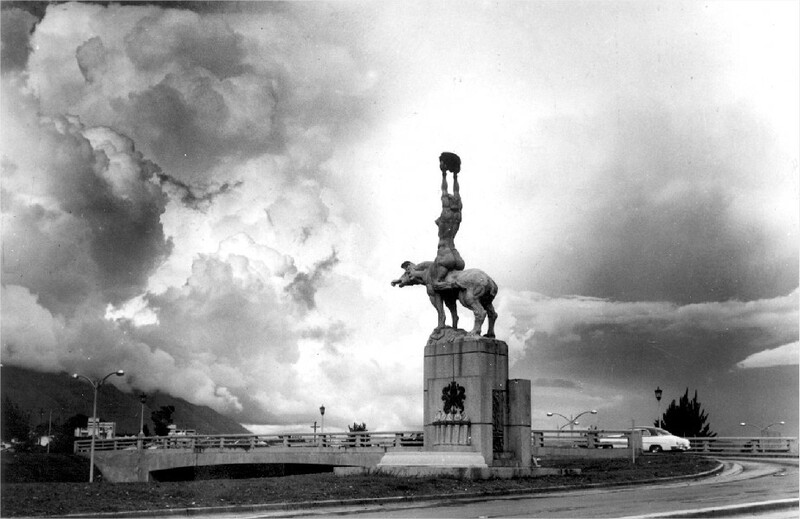 Due to her eyes, those living on Mount Sorte decided that María Lionza represented Spanish colonizers. 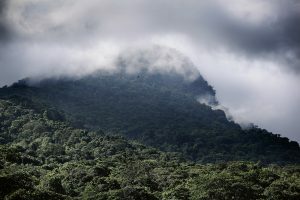 Hence, due to the bad blood between the two social groups, it was agreed by the indigenous people that she would be sacrificed to the God of the Mount Sorte River. The victory of this former lieutenant-colonel seemed to confirm a prophecy by Beatriz VeitTané, a self-proclaimed high priestess of María Lionza. 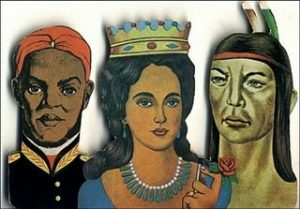 She predicted in 1967 that in the year 2000, ‘a messenger of light will rise from the humble classes’ to resurrect Gran Colombia, Bolivar’s short-lived creation (Siemon-Netto, 2011: 88). 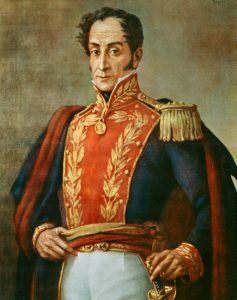 Bolivar not only helped liberate Venezuela from Spain but is also a Saint in the María Lionza lineage. Chavez was a well-known member of the María Lionza movement even before these stories of his reincarnation. The current Venezuelan president, Nicolas Maduro, is also a practicing Maríalionzero. Located northeast of the capital, it takes pilgrims up to five days to travel to the mountain from Caracas. Victor Turner (2011) explains that pilgrimage sites are located on the periphery of major cities, setting them apart from the state and other localized political and economic units. Turner (2011) states that pilgrimages take place during a time of political and social turbulence. Hence, the pilgrimage itself is a way for the individual to leave his or her familiar surroundings and travel to a place they are not accustomed to. This journey from normality to abnormality is part of the process of the pilgrimage itself. Further, through this process, a new vision and clarity springs forth within the individual, while preforming collective rituals with other Maríalionzeros throughout their pilgrimage. pilgrimage and his role as a medium while channeling Erik the Red titled, ‘In Need of a Cure’ on June 28, 2017. An interview I conducted with Perez regarding his thoughts and experiences of the pilgrimage in October of 2017 helped me gain a better understanding of the pilgrimage and its purpose. When medium Perez was asked why people took part in the pilgrimage every year, he responded that there were a variety of prayers, for health, fortune, love, money, etc. In addition, some viewed it as a form of paying back previous dues, while giving thanks to their ancestors. Perez also noted that there were several other mountains that people gathered at during the pilgrimage that are located next to Mount Sorte. 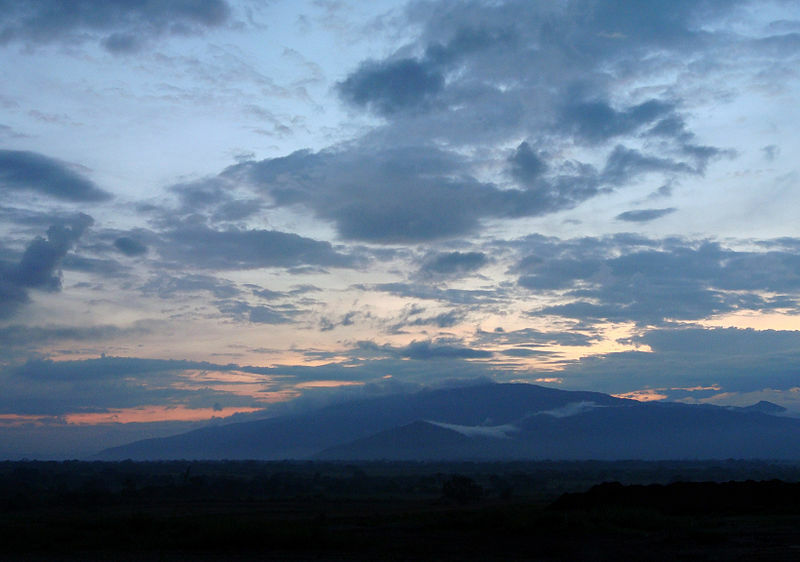 The two mountains Cerro Pellon and El Oro also house a large number of people during the pilgrimage. 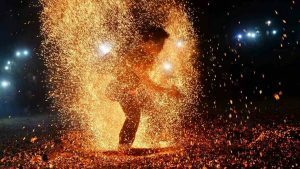 It is estimated that about 20-25,000 people are allowed to enter the area of the three mountains or sectors on October 12th, in order to take part in the baile de fuego or fire dance. El baile de fuego is a ritual that takes place, during the dark hours of the night. Surrounded by various fires, the rhythm of drums, elders within the movement, and with thousands of Maríalionzeros watching, individuals who have been blessed (se transportan) go into a trance- like state. They are able to dance on top of the fire located between the three mountains without getting burned. According to Perez, someone who is truly in a trance-like state will be able to put out the flames with their bare foot without hurting themselves. This proves that they are truly in a trance-like state and the ancestors or courts of spirits from the pantheon approve. However, one must ask whether the practitioners of the religion are acting differently and having different interactions with one another, due to the fact of their being under surveillance by the state? Even if practitioners do not physically see any guards during such ceremonies, it is well known that they are not only watching the ritual but ready to intervene at any moment if they fear anything could endanger the national monument, or Mount Sorte. In more recent video footage of the baile de fuego, one is able to see how the state has imposed itself, as there are now large lights surrounding the area. Parking lots have also been built alongside the mountain to ensure easy access for the state, in case of an emergency. Guards are also said to stay on the mountain throughout all nighttime activities, to prevent any forest fires that might occur during rituals such as the baile de fuego / bailie de candela, or the fire dance. The journey itself, especially now in the age of rapid transit, may seem on the surface like ordinary travel, but the pilgrims’ intention, their commitment to a spiritual journey, sets them apart from ordinary tourists. Other aspects of the journey may also differentiate a pilgrimage from tourism. Individuals may be part of a group of pilgrims under the guidance of a religious leader’. Therefore, having so many tourists present could make an impact on how pilgrims interact with one another and their overall journey. Considering so many tourists are visiting the site, one must take into consideration other geographical regions where the religion is being practiced and how so many people have heard of María Lionza. The second largest country in the world that practices the religious movement of María Lionza is Spain. Due to Venezuela facing hardship, Spain has recently seen an influx of Venezuelan immigrants, explaining why the movement of María Lionza has attracted more followers in Spain than in any other country in the world except for Venezuela itself. 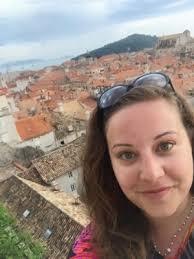 Thus, during the summer of 2017, I conducted fieldwork in Madrid, Barcelona, and Valencia, all in Spain. Throughout this time, I was able to speak with several owners of botanicas (or stores where they sell material objects for rituals) and learned that many of them were Venezuelan immigrants themselves. During las trances (or spirit possessions) that take place during the pilgrimage, spirits are invoked through Catholic prayers such as the Our Father and Hail Mary. The bancos or mediums talk and pray to the spirits as if they were already present. Tobacco is smoked, and rum is offered to give the spirits a nice passage. The banco also serves as an interpreter, once the spirits arrive. At times, evil goes against the banco or the materia. Therefore, both parties cleanse one another as a form of protection, before and after every trance or spirit possession. The sense of human connection and unity is the key. The ‘Indian’ court, led by María Lionza and comprised of many Venezuelan Indian Chiefs. Catholic faith, Jose Gregorio Hernandez. The court of ‘Juans’, which includes a collection of figures from folklore. The court of ‘Teachers’ led by the Venezuelan poet Andres Bello. The court of ‘Africans’ led by the famous black figures of Venezuelan history. The court of ‘Saints’ led by a collection of Roman Catholic Saints. this network should under no circumstances be interpreted as a static and set pattern – it is not a transcendent system or structure – but as a dynamic mix of relations in which objects, practices, and discourses meet. One of the main effects of this network is the constant updating of the images of María Lionza, as well as of their roles and meanings. While conducting fieldwork in Spain, it became apparent to me that botanicas located in all the three cities – Madrid, Barcelona, and Valencia – were running low on material ritual items, as they were being shipped from Venezuela. These items included candles, potions used for limpezas or cleansings, statues belonging to the pantheon of spirits that are part of the Maríalionza court, polvos or powders used for protection, and Catholic patron saint prayer cards. It could very well be that Venezuela no longer has the means to send such objects overseas due to its economic and political crisis. However, I did find it interesting that the state is now selling the same objects that are hard to obtain in Spanish botanicas during the pilgrimage. One wonders, are such objects are being blocked from leaving the country by the state? Because overall, there is a fear of how this religious movement can unify the people and encourage them to view everyone as being part of one unified nation, regardless of their physical residence. Given that the Venezuelan state does not have any way to watch practitioners of the movement as they have been doing on Mount Sorte, perhaps the state has not allowed ritual objects to leave the country, underlining notion of the visible and the invisible. Since their appearance in the early 1990s African and Viking spirits who attract most of the younger Maríalionceros, more than all the spirits in the pantheon, dominate the practice today. In Sorte mountain, just as in urban ceremonies, especially in groups dominated by younger materias, the spirits of Indians, liberators, doctors or peasants who were predominant for at least the last 50 years have given way to Africans and Vikings, both comprising a spiritist and bodily cluster difficult to discern. Packaged free market reforms sponsored by states and multilateral organizations during the last decades of the twentieth century, amongst them the inevitable increase of social inequality (Roberts and Portes, 2006: 32). amongst the most dangerous in the continent, with homicide rates rising from 20 to 22 in 1994-8 to 45 in 2006, with the most recent data in Caracas of 107 homicides per 100,000 inhabitants in that same year (Fernandez, 2009:46). newer generations of followers in the movement that grew up watching and reading about such tales revolving around Vikings and their fearless ideology of life. the body is a complex structure . . . a source of symbols for other complex structures . . . see the body as a symbol of society and to see the powers and dangers credited to social structure reproduced in small on the human body. If we take her theory into consideration, it is only natural that violence during spirit possession has increased in recent years, which is a reflection of how society makes the individual feel – through the realization, there is no control over their nation’s economy. An individual’s way of gaining control of the situation is through self-mutilation, found in spirit possession. People turn to the movement at a moment when national boundaries are under threat. María Lionza and the other spirits found throughout the twenty-seven courts said to possess and heal souls, are a pantheon of a political vision, a place where the state is present spiritually when it is not physically. The movement itself reflects the social body as a whole through the spirits worshiped in the pantheon of the twenty-seven courts. pollution ideas work on two levels 1. instrumental: people trying to influence one another; 2. analogies of social life: the general view of social order’. [t]he religion of the oppressed can assuage that oppression and adapt people to it, but it can also provide resistance to that oppression. Consequently, the dramatic change in the María Lionza movement geared towards violence and self-mutilation is a way for followers to rebel against the reality surrounding them. Instead of waiting until the state takes their possessions forcing them to steal and attack one another – they themselves attack first. In order to gain full understanding of the María Lionza movement and how it has changed due to the cultural, political, and social issues of the country, one must experience it first-hand. the deliverance must come in as strong a form as the complaint, if it is to take effect; and that seems a reason why the coarser religions, revival, orgiastic, with blood and miracles and supernatural operations, may possibly never be displaced’. Thus, within the body, there are aspects of the social body. The religious movement of María Lionza has gained popularity in Venezuela during a time of economic crisis. While the socialist government refuses to accept humanitarian donations, its citizens are progressively turning towards their indigenous religion. Blending African, Catholic and indigenous roots, María Lionza is a symbol of hope. As hospitals are closing down, African healing rituals found in spirit possession are becoming the norm, with traditional western medicinal practices no longer being an option. While living under these circumstances, it is no surprise that individuals are turning towards healing rituals and spirit possession as a way to gain control over their surroundings and society and that 50% of the Venezuelan population attends the pilgrimage each year. Within the crisis, there is a movement (María Lionza) which focuses on body and social illness and healing. People turn to the María Lionza movement because of its coherent vision of a social body. Everyone has a place and duty. While the state around them is in disorder, they find order within themselves by controlling their personal bodies. Possession heals people from what spirits think causes illness. The solution is to reaffirm the multi-cultural identities of Venezuela which all these courts are identifying with. Within the body, there are aspects of the social body. If each member of the court makes up the pantheon of worshiped spirits, each would be a symbol or social structure. The economic crisis and loss of control the Venezuelan people are facing today is reflected through spirit possessions seen in María Lionza. The rise in self-inflicted violence seen during spirit possession is a direct result of the social disparity people are facing. In addition, the fact that self-mutilation is a new phenomenon seen in healing rituals is merely a way to show how followers are trying to gain control of their society. The pantheon of spirits seen in the cortes or courts that are known to possess individuals are a representation of the diversity of people that make up the Venezuelan nation. Canals, R (2017) A Goddess in Motion. Visual Creativity in the Cult of María Lionza. New York: Berghahn Books. Davidson, LK and Gitlitz, DM (2002) Pilgrimage from the Ganges to Graceland. Santa Barbara, CA: ABC-CLIO. Douglas, M (2010) Purity and danger: an analysis of concept of pollution and taboo. London: Routledge. Lincoln, B (2014) Discourse and the Construction of Society: Comparative Studies of Myth, Ritual and Classification. 2nd edition. New York: Oxford University Press. Martín, FF (2004) Memorias Afligidas. Historias Orales y Corpóreas de la Violencia Urbana en Venezuela. Historia, Antropología y Fuentes Orales, (31), 5-27. Placido, B (2001) ‘It’s all to do with words’: An analysis of Spirit Possession in the Venezuelan cult of María Lionza. The Journal of the Royal Anthropological Institute, 7(2), 207-224. Taussig, MT & Ebrary, I. (2010;2009;) The Devil and Commodity Fetishism in South America (30th anniversary edition). Chapel Hill [N.C.]: University of North Carolina Press. Turner, J (2011) Religion Enters the Academy: The Origins of the Scholarly Study of Religion in America. George H. Shriver Lecture Series in Religion in American History 4. Athens, GA: University of Georgia Press. Originally published by the International Journal of Religious Tourism and Pilgrimage 6:2,9 (2018, 71-77) under the terms of a Creative Commons Attribution-NonCommercial-ShareAlike 3.0 Unported license. This entry was posted in History, Religion, Venezuela. Bookmark the permalink.